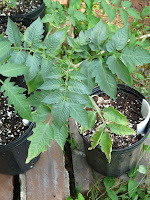 After the hail storm, I took a bunch of cuttings of my tomatoes and thought I'd share a down and dirty how-to. First thing is to identify a prime bit of broken tomato that you'd like to salvage. Branches work just as well as main stems, so pick a bit that has most of its leaves intact and minimal bruising on the stem. The piece I chose was a sucker from the main tomato plant. You can see how the stem was broken and pretty much destroyed. Above all of the breaks, though, was a fairly sturdy vine. This is where I chose to cut. Now that all of the decision making has been done and you've committed to a cut, the easy part comes. Plop that puppy into a pot. 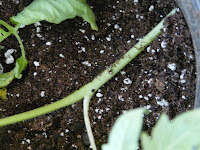 Since tomatoes root along the stems, I like to put a couple of inches (depending on the size of the cutting) under ground. This'll give you a pretty solid root mass in a shorter period of time. I laid the bottom of the cutting across the potting soil in a 1 gallon pot. 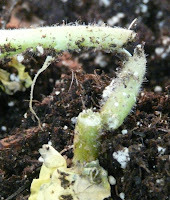 I bent the top of the vine upwards and packed potting mix around the stem. I watered thoroughly and gave the little puppy a squirt of Superthrive for added punch. And this is what it looks like a week later! Several of the cuttings are flowering and showing signs of greenies again. What a relief! I hope your tomatoes continue to recuperate, and that your gardens are blooming and producing!